Our skilled craftsmen are experts in working with hand hammered and hand tooled copper. These skills have been passed down from generation to generation, and are reflected in this gorgeous, handcrafted end table. 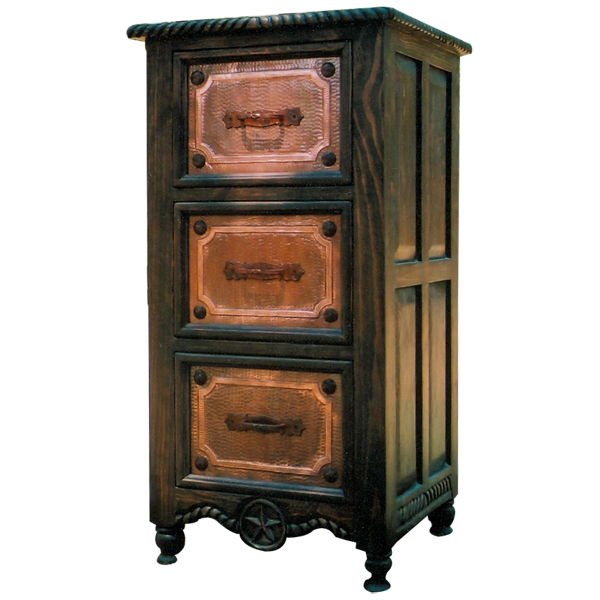 This custom end table features three, spectacular drawers covered with ornate, hand hammered copper. Each corner of each drawer is adorned with a hand forged, iron concho. The sides of the top of the end table have hand carved, rope twist designs, and the sides of the end table are embellished with decorative, solid wood panels. The lower frieze of the furniture is decorated with hand carved, floral patterns, and the end table is supported by hand turned feet. This custom furniture is made with the best, sustainable, solid wood available, and it is 100% customizable.